1949: Joan Vilella, Josep Puertas and Josep Bertobillo, collaborators of the guerrilla fighting against Franco in the Berguedà region, were captured, and after being held and tortured at the Guardia Civil station for 4 days, executed by firing squad. During their arrest, Bertobillo managed to escape through a window and hide in the stables of a nearby house. The owner recognised him and betrayed him to the authorities. Despite the precision of this starting point, we’re searching for the universal aspect of the concept (the act of betrayal) by looking at different events, such as Judas Iscariot’s betrayal, the file on informers held by the Catalan police force, our childhood schooldays… La Delació (Betrayal) is a consideration of the motives and the mechanisms of power that move and feed the fierce machinery of betrayal. Gerard Vilardaga is a poet, photographer and anthropologist. Iris Hinojosa has a background in dance, fine arts and psychology. 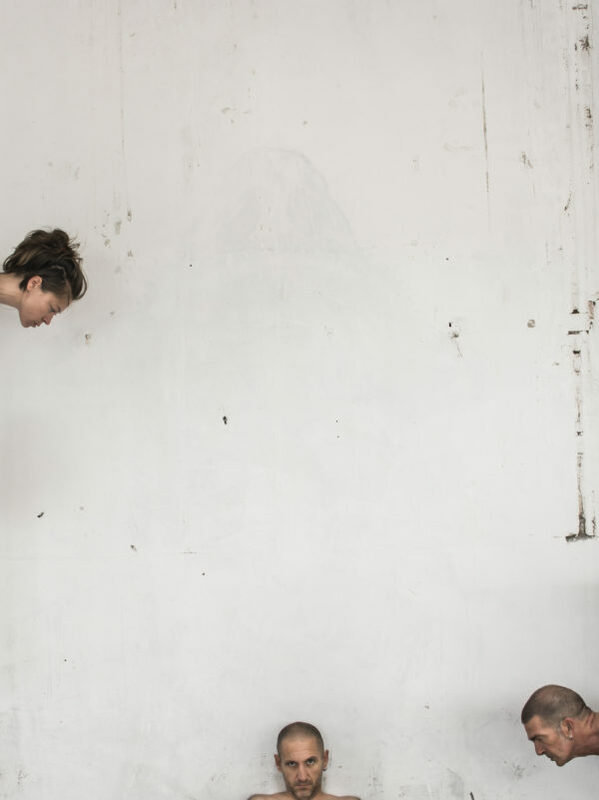 They are both members of Tràfec Teatre and they have worked as a pair on very experimental performance pieces, such as La perfecció és feixista or DO, both presented at Antic Teatre (2016-17). Javier Olaizola is a sculptor and percussionist who has played the txalaparta at concerts in various parts of the world. Together with Harkatiz Martínez he presented Parlant amb la paret at Antic Teatre in 2017. The three of them got together at el Konvent, a space for contemporary arts based at Cal Rosal, Berguedà, jointly creating Atàvic, an action based on collective forgetfulness, and now after an artistic residency at L’Estruch are presenting La Delació.